PRINTMARK designs and produces various sizes and forms of self-adhesive labels for descriptions of food and non-food products, bar coding, advertising, weighing machines. We produce white and colored labels from high quality thermo, opaque, glossy, semi-glossy paper or waterproof, fat-resistant and chemical-resistant polyethylene transparent and white films produced by a finnish company “Raflatac”. We will also produce advertising labels from metallized golden or silver, bright colored paper. 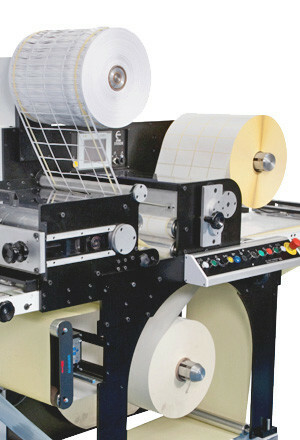 We print on self-adhesive labels using efficient Thermo Transfer (using this printing method there is no need to produce print forms, information may be easily modified, small amounts of labels are convenient to print) or Flexographic printing. We can offer a selection of various colors and shades, as well as varnishing. VELLUM – the most frequently used paper for production of labels for products as well as informative labels. COAT – semi-glossy paper for various applications, for production of high quality colored labels. THERMAL ECO – thermo paper of standard sensitivity, suitable for weighing-machine labels, price tagging, description of product in retail trade, used in dry environment. THERMAL TOP – thermo paper for universal application, used for weighing-machine labels, when print’s resistance to natural impact is required, it does not fade or stain. Frequently varnished additionally. PE GLOSS WHITE/ PE GLOSS CLEAR – white glossy/transparent glossy activated polyethylene film, waterproof, fat-resistant and chemical-resistant. Excellent for application in cosmetic, perfumery areas. SILVERVAC/ GOLDVAC – metallized silver/golden paper, suitable for production of very high quality glossy labels. Frequently used for advertising and decorations. FLUOR – very bright colored paper, suitable for advertising labels. UNIVERSAL – the most popular adhesives, excellent for application on various surfaces, stay for a long time. ADHESIVES FOR FROZEN PRODUCTION – well adhering adhesives for damp, cold products, suitable for products kept in refrigerators in temperatures of -20°C to -40°C. STRONG ADHESIVES – excellent for application on uneven, damp surfaces, very strong initial adhesiveness. SUPER STRONG ADHESIVES – adhesives are suitable for very rough surfaces, when labels with regular adhesiveness do not stay on – for example for tyres, other rubber surfaces. EASILY REMOVED ADHESIVES – adhesives that are easily removed even after using for a long time. WASHABLE ADHESIVES – adhesives that are easily removed by water, suitable for multiple use containers.